in Beauty Reviews on Jul 11, 2017. There is no doubt that makeup enthusiasts love buying makeup products and their stash is always filled with stuff such as eyeliner, mascara, kohl, lipstick, lip balm, lip gloss, foundation, bronzer, blush, highlighter, eyebrow pencil etc. As much as you enjoy the benefits of these products, maintaining all the makeup can be really tuff. You may end up with mess and clutter, especially when you are traveling. To make matters both simple and stylish, Cherry Blossoms has a 2-piece beauty organizer set which helps store all your beauty and makeup products. Cherry Blooms 2-Piece Beauty Organizer Set comes in four different styles: Matte Leather, Patent Leather, Chevron, and Paris, which retails for $69.99. It features 16 separate compartments and can hold 80+ products. It keeps your beauty products safe, secure and organized. "I've designed a solution to keep my makeup organized when at home and when traveling. I love that you don't have to pack and unpack each time and it looks great on my beauty dresser and I can find my go-to products easily" says Jellaine Dee, Founder of Cherry Blooms. 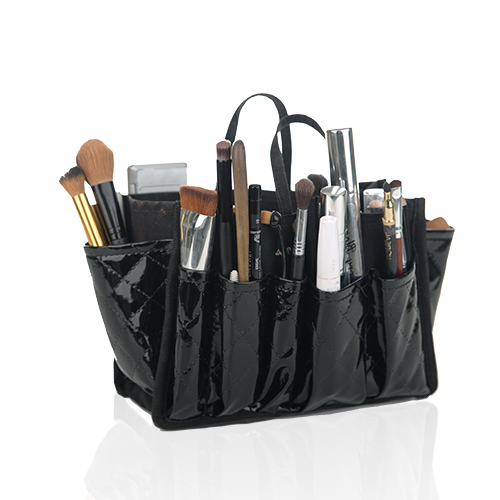 The beauty organizer includes one toiletry bag and one small bag organizer. Set the ready-to-use insert on your makeup dresser for easy access. When on the move, simply place it back into the handy carry toiletry bag and lay it flat in your suitcase. Personally, after using this beauty organizer in Quilted Patent Leather style, I feel organizing makeup products couldn't be easier. I can clearly see all the products and they are all easily accessible. The organizer has a slim & compact design for travel with side opening and two zips. It also fits in any carry-on bag or suitcase with ease and I couldn't ask for more! If you wish to own this makeup organizer, head over to Cherry Blossoms and make your purchase right away! Disclosure: I received Cherry Blooms 2-Piece Beauty Organizer Set for free to facilitate this post. However, all opinions are my own.